What a great time to be trolling the Farmers Markets. This past Sunday I checked out the Rye Farmers Market to chat with the market manager about my upcoming demo there on July 7. I also took the opportunity to speak with a couple of the vendors and pick up a few things to cook this week. I was bowled over by the gigantic mound of snap peas at the Migliorelli Farm table. 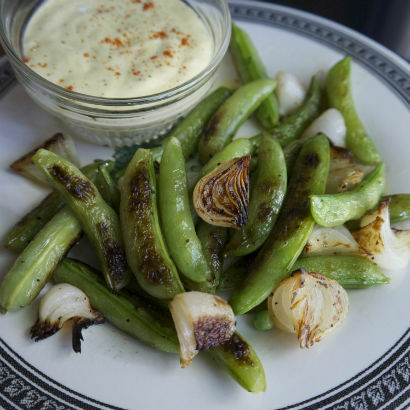 I had just come across a recipe in Chris Cosentino’s book Beginnings, My Way to Start a Meal, and was inspired by his recipe for Charred Favas and Aioli. The dish was so simple and rustic looking, I suspected it would translate well with snap peas. 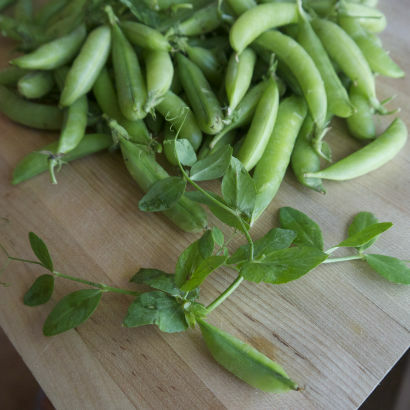 Snap peas, sugar snap peas and snow peas all hail from the same cultivar group of edible pea pods. 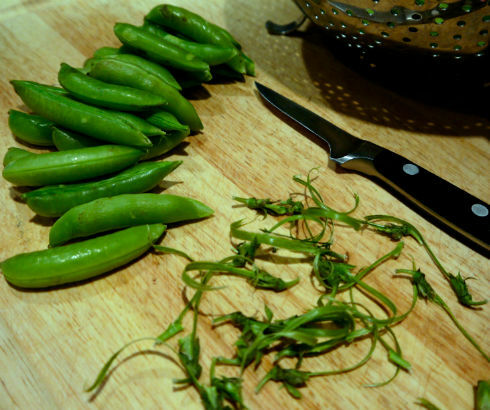 Snow peas have a slightly different look about them, being very flat with teeny peas inside. The peas I picked up are known as snaps or sugar snaps. They are high in Vitamins C, K and also a fair amount of A and Fiber. They are low in Cholesterol and Fat, and do contain some sugar, as indicated by their name. But don’t confuse that with processed sugar, we’re talking natural sugars as you would find in fruits. They are delicious steamed, sautéed, tossed in salads or as part of a stir fry dish. I decided on a high heat method of charring them with the notion of making an appetizer. After giving them a a good rinse in cool water I nipped the end and pulled off the little string. 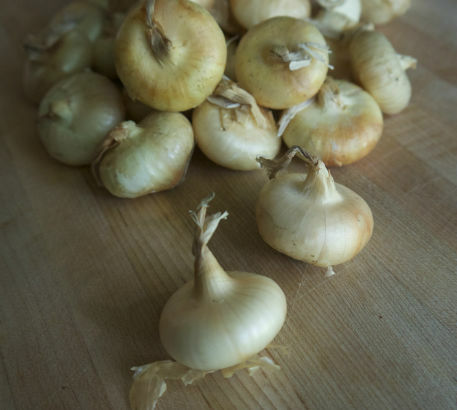 I also picked up a bunch of cipollini onions and thought it might be interesting to include them as well. If you’ve never tried these do yourself a favor and pick some up. They are small, sweet and cook very quickly. The most ideal way to sauté or braise them. 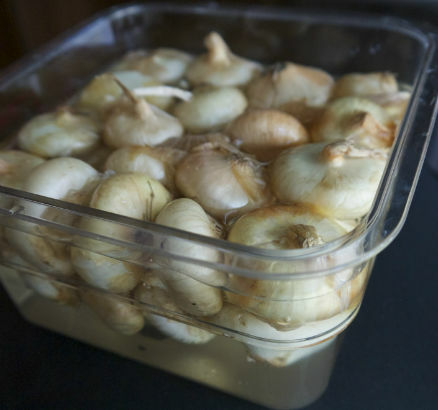 Cleaning them is easy this just a few steps: soak them in a little warm water for 5 minutes and then drain. The thin papery skin will peel off easily. Trim the root end a tiny bit with a paring knife, but keep it intact. That will hold the onion together while cooking. For this dish I cut them in half at the root end and they worked perfectly. This coming Saturday I will be demoing my recipe for all to taste at the John Jay Homestead Farm Market in Katonah. This is another one of my favorite Markets. Set in front of the gorgeous John Jay Homestead in Katonah. This week Tiny Hearts Farm and Cabbage Hill Farm will be there with lots of peas, so come and get them while you can. Be sure to stop by my table and say hello as well.